You do a day’s work and you expect to get paid in full. But some forty people say that wasn’t the case when they were hired to work at a ritzy South Florida hotel event last spring. The group held a protest July 16th outside of the Trump National Doral Resort where they say they worked last April during a Passover event organized by a private company and staffed by a man called Stephen Satz. Debra Basterrechea was one of the protestors. “I was hired for the Passover event, we worked eleven days and we were never paid for working 20 hours a day,” she says. Over 40 workers contacted the Team 6 Investigators saying they were owed money; all together more than $43,000. They say the work was grueling, the hours were long. 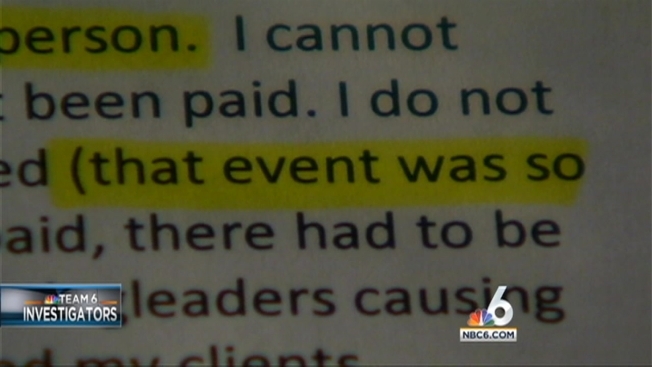 NBC6 obtained a schedule showing events lasted nearly 20 hours. “We worked liked slaves and sometimes we didn’t even have water to drink,” says Jennifer Ermis, another worker who showed up to protest. The Miami-Dade Consumer Services Department is now investigating five complaints made against Satz for alleged wage theft. They say they've tried to serve him with documents but so far they’ve been unable to. Catherine Forte, a county investigator says they “continue to make strides to find” him. Satz’ records show that 2000, Miami Dade police accused him of grand theft saying he failed to return 136-thousand dollars a title company sent him “in error." Satz turned himself in and agreed to spend 10 years on probation. The people who say they got stiffed say the resort should screen outside staffing companies before they are allowed to do business on their premises. Miami Dade Consumer Services Investigators say they will continue to try and locate Satz to resolve the wage dispute and anyone who feels they are owed wages should file a complaint with their department. The county says they will investigate each complaint, try to mediate and if all else fails; take the employer to court for free. The only requirements are that the claim be for more than 60 dollars and the work has to have happened in the last year. To read more about Miami Dade’s Wage Theft Ordinance or to file a complaint click here.